In an interview with his hometown newspaper, the Lowell Sun in Massachusetts, Drew Gallagher ’11 discusses his recent teaching awards and educational disparity in the nation’s capital. 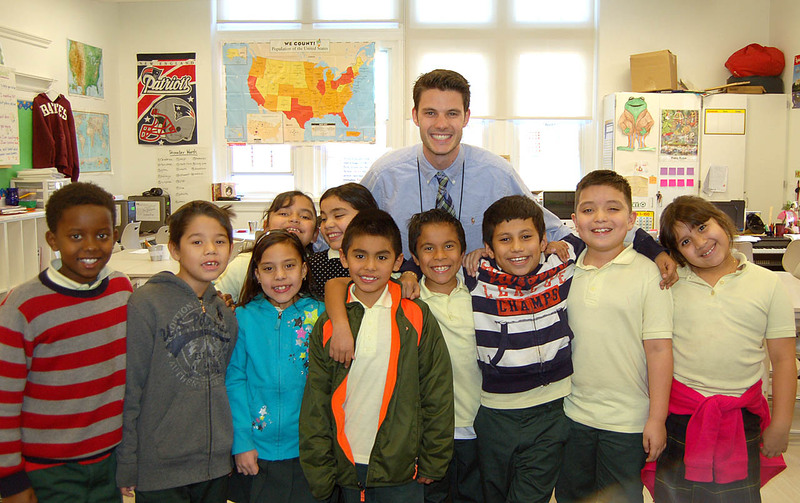 All smiles, Drew Gallagher ’11 poses with a group of his students at Bruce-Monroe Elementary School in Washington, D.C. Photo courtesy of Drew Gallagher ’11. Entering the teaching profession through Teach for America, Gallagher was one of nearly 600 new first-year teachers in the Washington public schools in fall 2011. That year, Bates was ranked 17th in the country for number of Teach for America participants. He won the New Teacher of the Year award in 2012 and the Rubenstein Award for Highly Effective Educators, an honor he shares with just 27 other teachers in the district. The award comes with a $5,000 cash prize. Gallagher teaches at Bruce-Monroe Elementary School, where 61 percent of students are multilingual or English Language Learners. Almost 90 percent receive free or reduced lunch. As a Teach for America recruit, Gallagher made Washington, D.C., his top choice precisely because it is one of the lowest performing urban districts in the country. What do we know about Bates’ first Irish-born graduate?